It was in our minds to revisit an eccentric old lady at Peckett Well, in the direction of Keighley. Fred and I had met her in November 1930, in the course of a run in the Haworth country; she kept a small sweet shop in a cottage on the moors, and served cups of tea as a sideline. Although quite a dear old dame, she had become afflicted with a most primitive kind of religious mania, and when she had rather frugally served our tea, the good woman started on the most fervent discourse. Apparently she had convinced herself that heaven had sent us, ripe for conversion. We listened with dutiful silence and profound admiration at the flow of quotations, which hopelessly damned every other religious sect, and condemned all modern innovations as vehicles of the devil, but the only thing we became convinced of at the end of a two hours’ sermon was that she was becoming, in her old age, an introvert. So we arranged for a party of us to repeat the ordeal. The road between Bolton and Rochdale, via Bury and Jericho, covers thirteen miles; and of those, ten miles have setts and tram lines. The next four to Littleborough have also tramlines and setts, which are at their worst, and that is bad! Seven of us climbed Blackstone Edge in heavy rain – it had rained all the morning – and stopped at the Shepherd’s Rest on the way for coffee, which was poured from a great jug into generous cups ad-lib. From the summit of Blackstone Edge the usual views were smothered in rain-clouds, through which snowy crests showed faintly white. Speckled with snow, the russet moors down to Cragg looked grand, but Mytholmroyd (pronounce it ‘Momroyd’) brought industrialism into the valley which must have had it’s beauty once, all the way to Hebden Bridge. From there, a two mile tramp up to wet, windy moorlands, with the winter-stripped woods of Golden Valley below took us to Peckett Well, and the old lady’s cottage. After lunch our hostess, having again persuaded herself that we had been specially sent, gathered us round like a Sunday School class, and for nearly three hours held forth on the wickedness of the world, and the heavenly warmth that permeated The Brethren. We were exhorted to give up our ways of life, including cycling, particularly on Sundays, not even to ride on buses, and by closely following the Path which the Lord had personally revealed to her, we might expect to dwell, not in the halls of the Chosen, but in, say, a tiny sheep-pen far down the scale. It was quite natural that she would inherit a substantial part of the Kingdom, who had been so good all her life, and we, who were starting late, would have to be content with a small apartment almost, but not quite in, the Outer Void. When she put in the bit about giving up cycling there was a startled look about us; that, we thought, was going too far, and there was a definite reaction, a kind of hardening of our hearts. We began to feel a conviction that perhaps after all, this world of sinners is preferable to the tinselled emptiness of weary immortality. As Mark Twain put it, ‘her statements are interesting, but tough’. We got bored and were glad to plunge into the wild conditions which reigned outside. One of the two Fred’s departed for home and a patiently waiting sweetheart. It was well for him that he did! The rest of us, eyes glued on the map, joined a tenth class road that struck across a ravine. The lane had, however, long been claimed as private property, and in consequence we had obstacles to cross, wire fences, ploughed land, and stone walls. No obstacle, however, has yet barred our way. A hillside road we found was bad and snowbound, but it led along some fine moors to the valley road that runs up from Walshaw Dene, a gorgeous bit of river scenery, with the streams in flood. At a fork-road we chose the left one, a new looking road, under the impression that it was the Longcauseway, leading to Burnley, and ran into the teeth of the wind. After two miles of slogging we fetched up dead in the midst of the huge, half finished Gorple waterworks scheme. The road had only been built for the scheme. By that time it was 5.10pm, and we had all acquired ravenous appetites, but we were determined not to go back. A workman mumbled some hazy directions, as a result of which we struck across a forest of railway lines, over many improvised bridges, and simultaneous with nightfall, arrived in the middle of a vast, churned up claybed, the very bed of the reservoir-to-be. 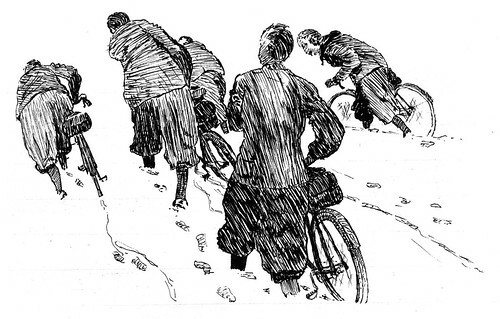 We struggled over the awful morass, sometimes on our necks, until we were daubed all over with yellow clay, somehow keeping the bikes with us, and at last, by good luck, reached a road leading out of it. In two more miles this road, which had sunk to the level of a miserable track, came to a full stop amongst a collection of log huts, pipes and steelwork, the upper part of the huge scheme. The outlook was extremely unhealthy. Our hunger had got us where we needed to be strongest – at the knees – the wind swept across in a sort of savage glee at its six shivering playthings; the rain battered in like a whip, and all the daylight was spent. Dark bulky moorland with rocks on the easterly summits hulked up in the gloom like grotesque fantastics in a world of unreality. It didn’t occur to us to light our lamps, the poor glimmers from the cheap oil lamps we used at that time could hardly have helped us anyway. Somebody discovered a track or a stream – I think it was a bit of both, so we all followed, strung out like sheep, and got thoroughly soaked from the thighs down, and from the thighs up. Eventually a farm building loomed black and ruinous, we trooped through the deserted yard and along another track which took us on to something faintly resembling a road. This was the Widdop Cross-Worsthorne road, locally called the Gorple road, but none of us knew that, we just tramped on, still in single file like sheep, but joking, perhaps an unconscious attempt to keep our spirits up. I have noticed time and again that tendency to laugh in the face of adversity. Hopes of an early tea had gone, yet blithely we lied about the warm, cosy room awaiting us in the nearest hamlet, though we suspect the probability of getting just the opposite. A real river came on to the road, and for a long way kept there; we dimly saw the water, heard it’s chattering beneath our feet as we waded along it. Our clothing dripped to the last stitch, yet we still thought life funny, while Jo, the only woman present, took her part like a man, reacting finely under such impossible conditions. The one saving stimulus was laughter. The condition of the road was shocking, piled with slushy snowdrifts, dissected by water, and lower down a mere heap of stones. At last we saw light ahead, and descended into Worsthorne at 6.50pm. We found a warm cabin where tea, hot pies and peas were served to us, and even the wooden forms and trestle tables were as velvet stalls in the dining halls of heaven. Nobody complained. The day was hopeless, the project mad, causing at least one physical collapse, a fight with pneumonia, but we emerged neither sadder nor wiser. At Peckett Well pearls of wisdom had been cast before us, a chosen path had been outlined for us, but we chose our own and it had proved a Pennine Counterblast. Even now it has not occurred to us to fulfil the first condition. We have chosen our path, lead where it will !